Camping with family makes for great memories. 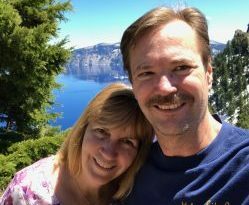 We were happy to camp with Deb’s sister and brother-in-law in the Monterey areas as they were finishing their first trip in their new motorhome! Just kidding Mike and Sandy! 🙂 This is their beautiful new RV! to the SANTA CRUZ / MONTEREY BAY KOA. I liked the surfing theme of the park. It’s a really nice RV Park that’s very well groomed and has lots of large sites. It’s a great place if you want to stay put and let the kids play. Otherwise, it is off by itself and a drive anywhere you want to go. The next day we went to 17 Mile Drive for some great views. Our daughter Kaylee and her boyfriend Jon joined us the next day. They brought Liam, a friend’s dog they were watching. Lucy and Liam had a great time playing in the dog park and tiring each other out! All in all we enjoyed our stay and hope to enjoy many more camping trips with Mike and Sandy! My wife and I love to look at your adventures over coffee in the morning. You give us great ideas where we can go camping in mour little Ruverside Retro. Danny, we saw over 300 vintage RVs in Pismo Beach last month. I can see why retro RVs are so popular. Take care! You may also want to consider a camping trip in the CA Delta. Rent a boat in Tracy to tow to Discovery Bay. Especially during waterfowl migration times. Historic towns, great bridges, etc. You can get off the grid. What #RV Parks would you recommend in the delta? I’ve been wanting to plan a trip there! beautiful photos, I really liked the landscape shots of 17 mile drive.